I love to write with a pencil, and my favorite is a plain, old wood pencil. The pencils in the picture aren’t plain or old…but they work just the same, only prettier. I cannot have this stuff in the house because I’ll eat it right out of the jar. 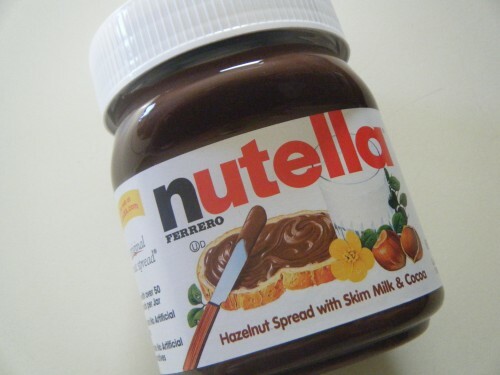 Note: If you ever stay at my house and there is Nutella in the cupboard, don’t eat it unless it is an unopen jar. An open jar probably has my germs in it. Here is an awesome recipe from Erin’s Food Files…Nutella Cookies. The best way to dust is to remove items from a piece of furniture and dust the furniture and items with a soft cloth. 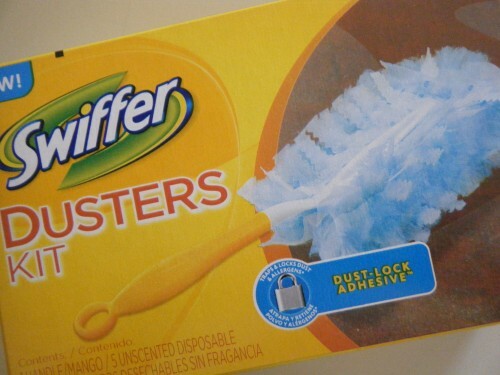 But, when you notice a thick layer of dust right before you have company and want to tackle it, the Swiffer Duster does the trick. Its thin, light, flexible design gets in and around things beautifullly. 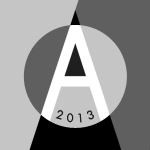 This was one of Amy’s favorites for 4 Faves – Friends Version…but I stole it. 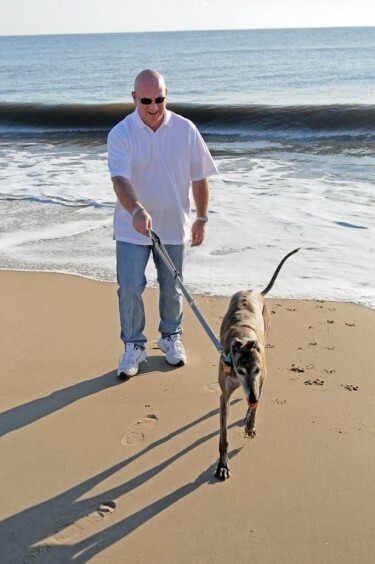 The Ultimate Leash is fully adjustable from 4-6 feet, offers a hands-free option with an easy clip-around-the-waist buckle, and has a convenient velvet-lined 1 foot traffic handle and adjustable slide handle. 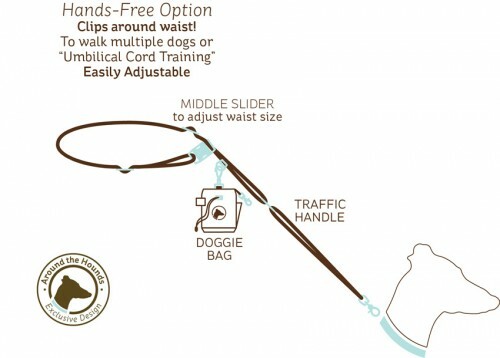 It also has a clip for the optional Ultimate Doggie Bag. 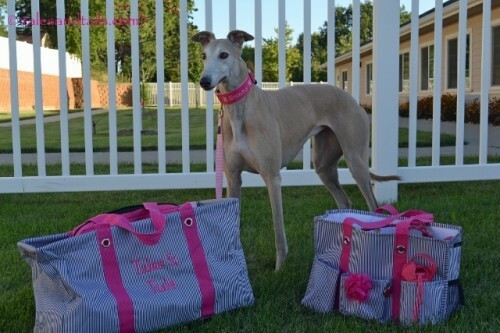 For fashion conscious pups, it comes in 9 colors and your choice of hardware finishes. Where do you get it? Around the Hounds. 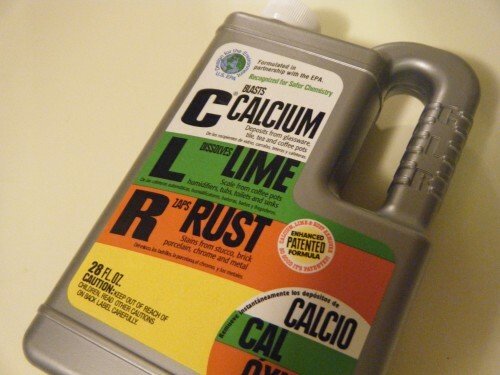 I keep CLR on-hand for dissolving tough calcium and lime deposits and surface rust stains. It’s effective, and CLR has earned the EPA’s DfE (Design for the Environment) designation which means that it contains only those ingredients that pose the least concern to human health and environmental affects. 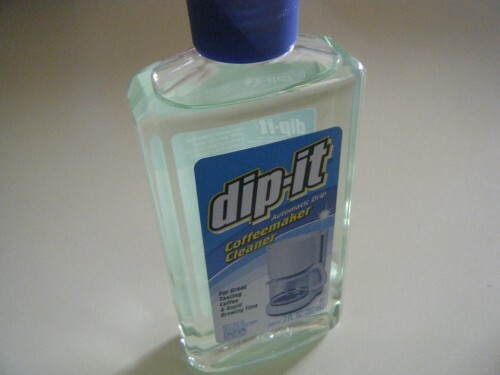 Keep in mind though, CLR is corrosive, so make sure you read the instructions and use it only as directed. 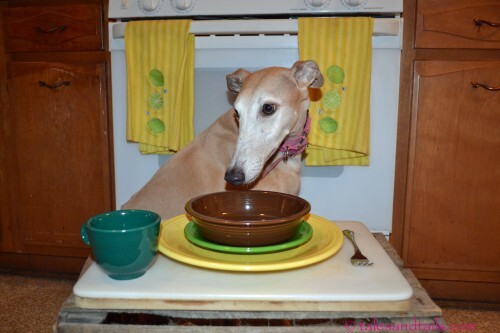 I wanted a fun and functional way to move Freedom, Casper and Nikki’s dog tags from collar to collar (Greyhounds have a thing about fabulously fashionable collars). 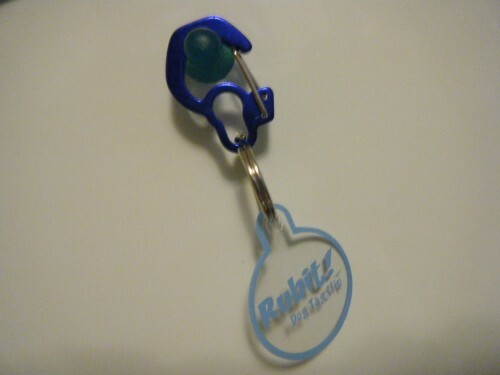 The Rubit! Clip filled the bill for me. 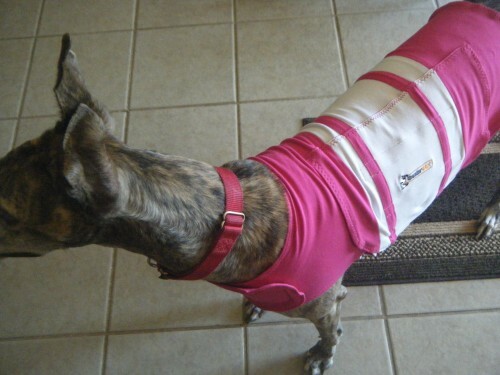 It comes in a variety of sizes (my houndies sport the medium size) and colors. You can even get them with a little bling (rhinestones). I found these on vacation when I needed a pair of shoes for walking on the beach. I picked up a pair of Crocs and fell in love. They’re cute, super lightweight, comfortable and easy to clean. 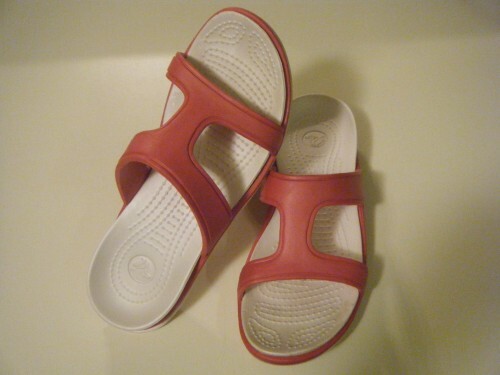 I’ll be checking out the Crocs brand a little more closely in the future. Yet another vacation find! 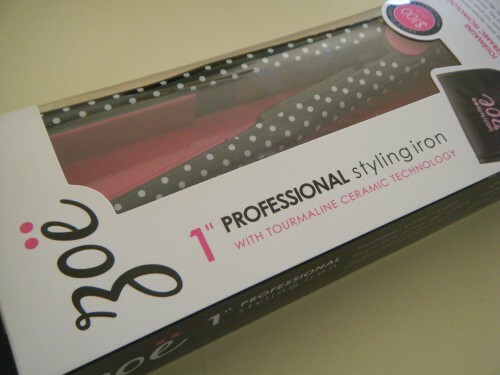 My styling iron was on its last leg, and I was tired of getting burned using a regular-size styling iron on my short hair. The thinner plates are perfect. This one is from Zoë. 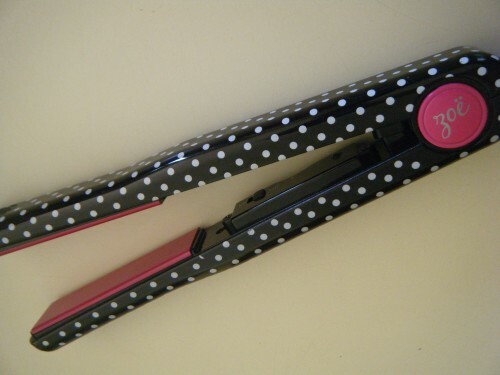 Aren’t the polka dots adorable…that’s a bonus. Travel mugs often make me nuts because I feel like I never get the lid thoroughly clean. 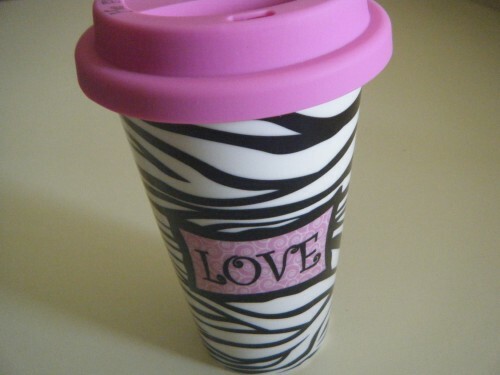 My friend, Amy told me about this type of travel cup. It’s sturdy, beautiful and the best feature…easy to clean. I know that no one will be able to relate to this, but whenever my husband and I do any “home improvement” project, it generally dissolves into a marriage threatening fight to the death…and that’s usually within the first five minutes. I know, it’s just us. This makes me an independent woman with skills. 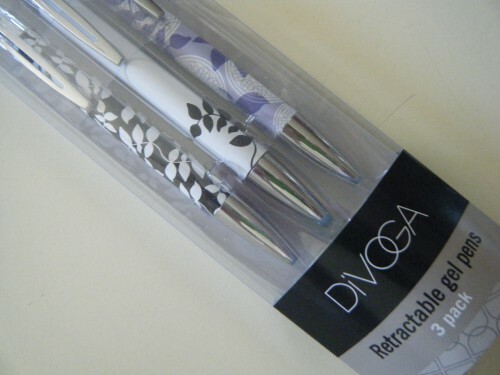 These pens have a nice weight, they’re beautiful and they write smoothly. I decided to make them a “favorite” because EVERYONE who borrowed one from me commented on what a nice pen it was…even my husband. 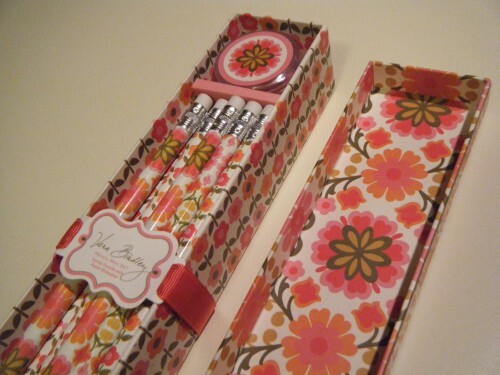 I purchased this set at Office Max. I wanted to give Freedom, Casper and Nikki something to chew on that was long-lasting, but I worried about giving them a bone to chew on. Then, I found elk antlers. 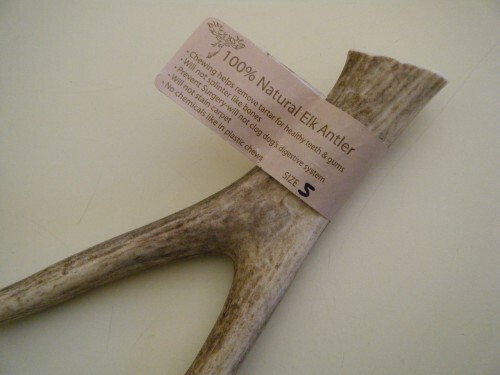 Elk antlers are naturally shed, they don’t splinter, chip or crack, and they’re odorless and don’t stain. Perfect! This is my favorite coffee maker cleaner because it removes stains and oils as well as lime, calcium & other water deposits. This is my new favorite bra. It’s supportive, the straps don’t fall down, it has a smooth silhouette under your clothes and it’s SUPER comfortable. Added bonus…very inexpensive. In fact, they’re down right cheap. 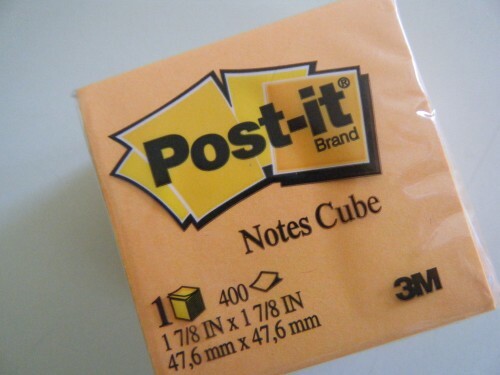 How did we ever live without these things? 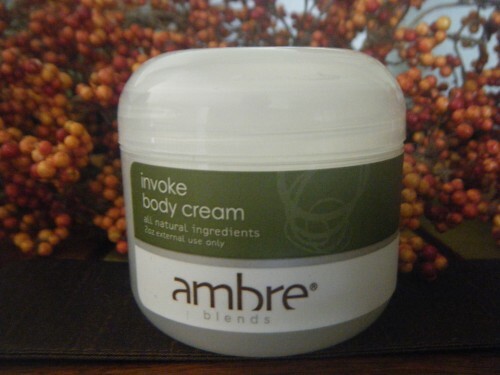 Amber essence is the base of all Ambre Blends. I love the way these smell and a little goes a very long way. If you love natural, organic frangrance, give these a try. 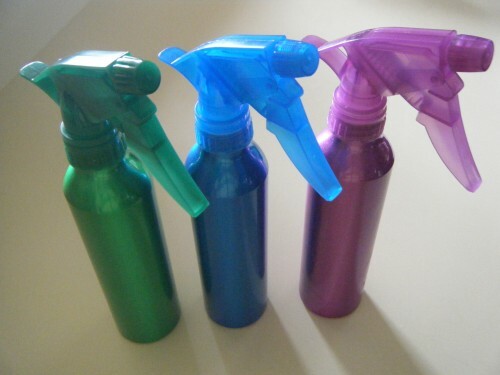 I use a spray bottle filled with water like some women use an iron. I lightly tumble dry my clothes, hang them up and give them a light spray…voilà, no wrinkles. Unfortunately, it’s been hard to find a spray bottle that works. I stumbled upon these aluminum spray bottles in the “dollar” bins at CVS. They are fabulous!…pretty too. 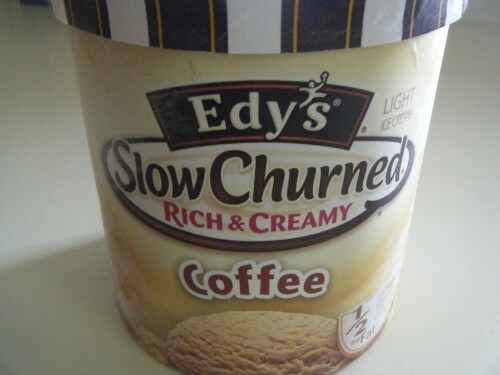 Edy’s is pictured, but I’m a sucker for ANY coffee ice cream. Yum! 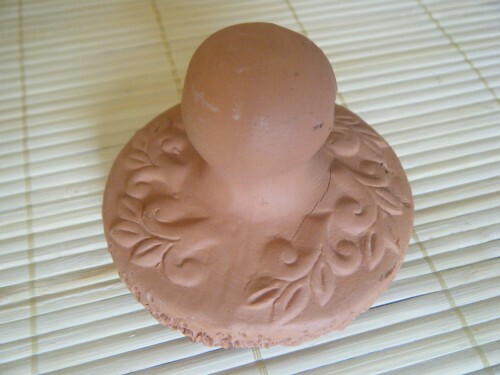 I picked up this pretty, functional tool at Ten Thousand Villages. 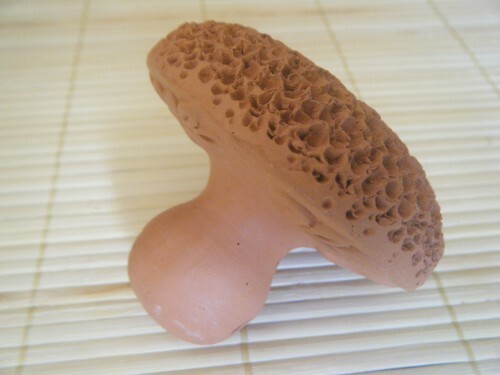 Crafted from terra-cotta, you use it on your feet like a pumice stone . 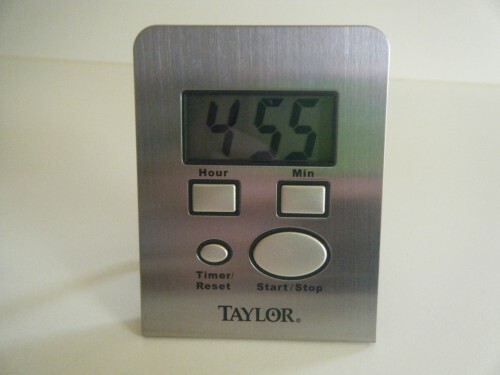 I should have titled this fave “Big Buttons,” because that’s why I love my new kitchen timer. 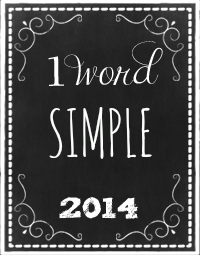 It’s big, easy to read and simple. It has a flip down stand, to sit on the counter and a strong magnet, to hang on the refrigerator. What’s not to love. 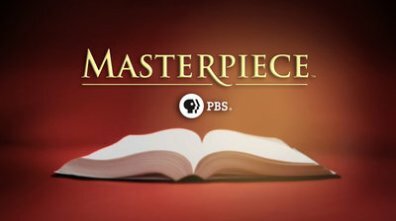 Premiering on January 10, 1971, Masterpiece™ is the longest running weekly prime time drama series in America. It began as Masterpiece Theatre®, but in 2008 it was divided into three sections: Masterpiece Classic (beloved signature period dramas), Masterpiece Mystery! (the best British mysteries), and Masterpiece Contemporary (dramas set in today’s world). I love them all. A cute little story…When my daughter was about 6-years-old, I was watching Masterpiece Theatre. In her very best 6-year-old British accent she said, “Masterpiece Theatre, producted by the Children’s Television Workshop.” Well, almost. I did many things that didn’t fall in the “Good Mother” category, but withholding PBS wasn’t one of them. 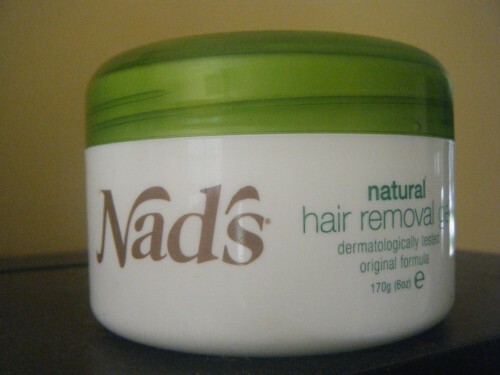 This isn’t for everyone, but if you hate shaving with the purple passion that I do, this is a great alternative. I think this is very cool. 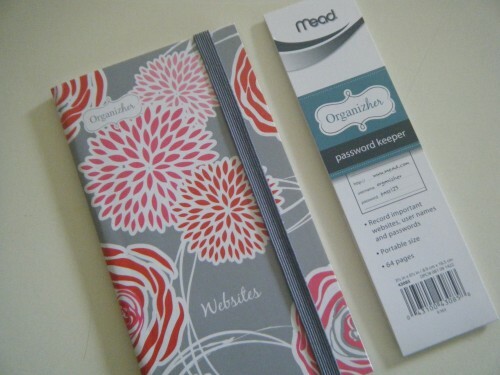 A neat, pretty place to collect and organize all the User Names and Passwords that modern life requires. 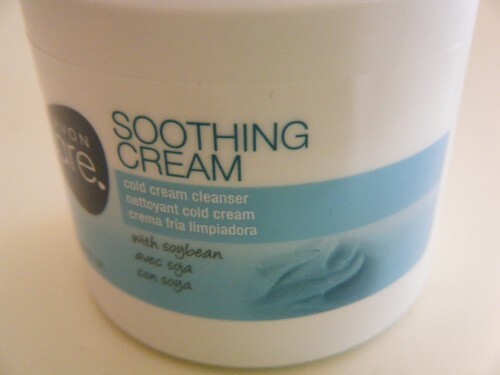 I don’t use cold cream every day, but I love to have it in the medicine cabinet. When it comes to removing stubborn make-up or in the winter when my skin is begging for moisture, cold cream is wonderful. Beth Moore is an evangelist, teacher and author. I love Beth Moore Bible studies. The Bible studies are generally presented in a 12-week format that includes a weekly hour-long video and 5 days of workbook homework. Beth Moore always helps me understand more about myself, the Bible and my faith. 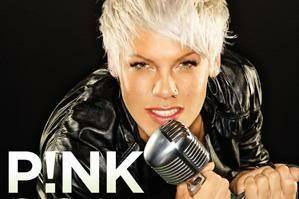 Fun Fact: Another famous Beth Moore…P!nk. Her given name is Alecia Beth Moore. Silicone is popping up everywhere in the kitchen, and it is terrific! 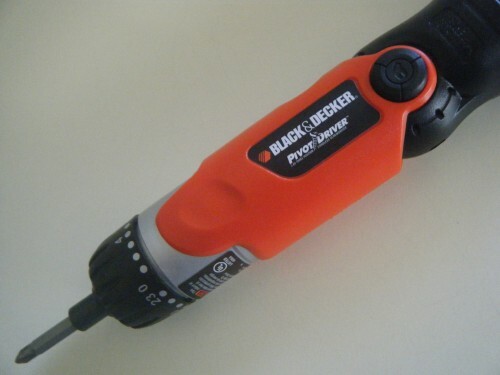 I like the heat resistance, the bright colors, the flexibility and the easy cleaning. 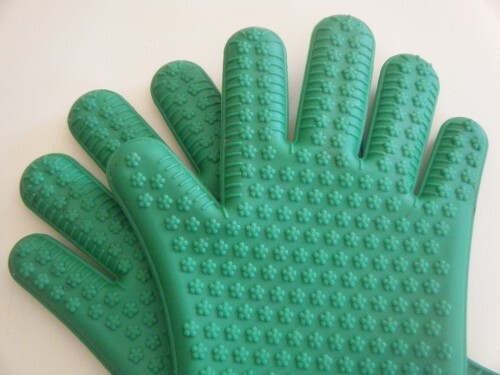 Pictured above are silicone oven gloves from QVC. My husband loves them for moving things around in the smoker and carrying hot dishes. I’m updating the hangers in my closet. Here’s why I like these: They don’t have the little strap indents (I just don’t like those), they are shaped to reduce “shoulder bumps,” they’re thin yet strong and because of the flocking, clothes won’t slip off. I also like the cascading hooks you can add to the hangers. 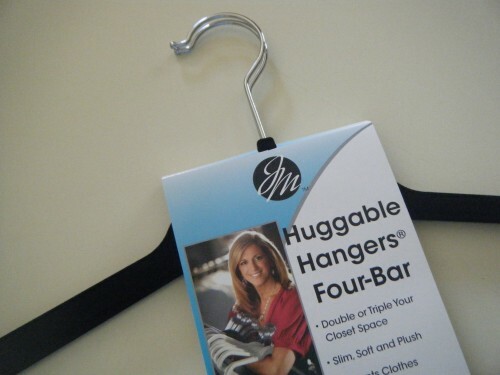 Note: If you’re the type of person that likes to pull your clothes off the hanger, DON’T GET THESE HANGERS! That flocking really works and you’ll end up ripping your clothes or pulling down your closet rod. Don’t ask me how I know this. August’s 4 Faves all come from my friends. Check out what they like. 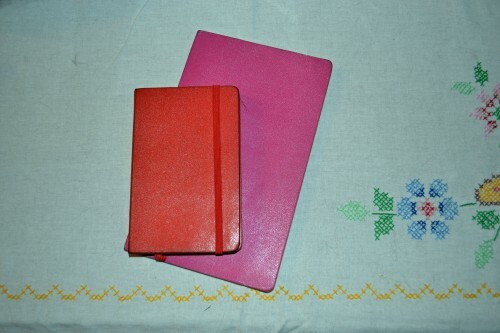 This week’s favorites come from my friends, Amy…she has the first three; and Bunny of Tales and Tails…she has the last one. Look at the picture above, then look at Zonda & Miura below. Aren’t these perfect! 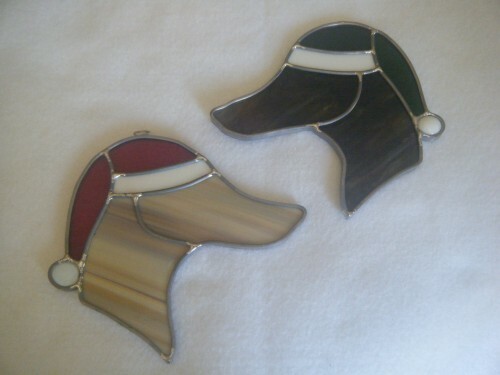 Greyt Glass offers glass panels, ornaments, suncatchers and inlaid glass stepping stones. 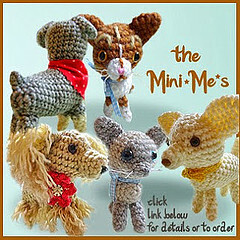 Check out their website or “like” them on Facebook. 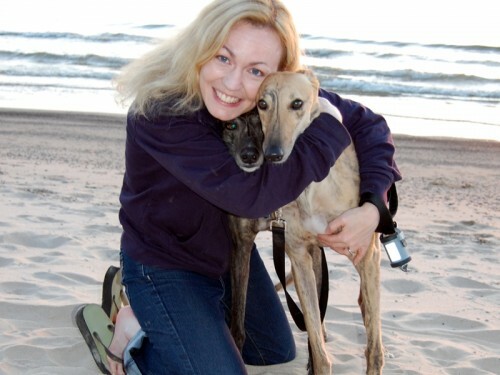 When I spoke with Amy about why she loves Ginis Greyhound Fashions, “Customer service, customer service, customer service.” Other reasons…coats are made to custom measurements, which means a fabulous fit, and fantastic fleece color combinations, that you get make. 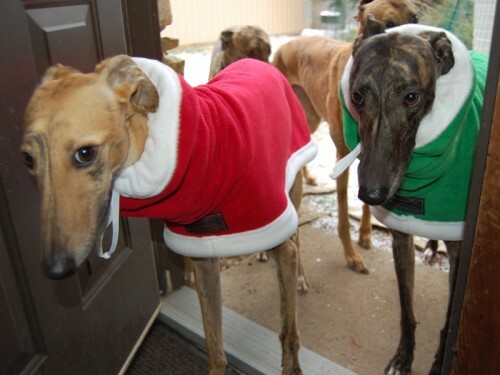 Don’t you love Zonda and Miura’s Santa coats! 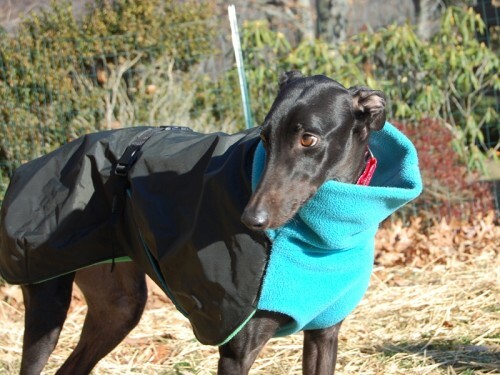 Amy loves the Greyhound raincoat from Voyagers K9 Apparel. Why? 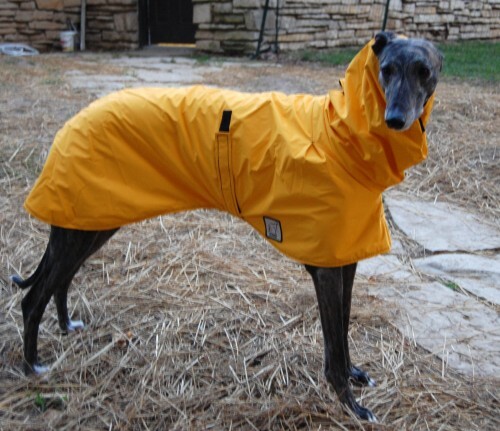 It has front pleats for easy mobility, the hood covers without binding (very important to Miura), it offers great coverage, it has a reflective safety strip across the back for better visibility, and Amy loves the school bus yellow…a classic color in rain slickers. Bunny recommends ICE CREAM as a favorite. I think we’re all with you there, Miss Bunny. 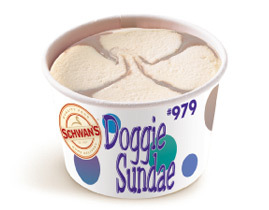 Bunny’s favorite (and Lilac’s, and Blueberry’s and Morgan’s) is Schwan’s Doggie Sundaes. Yum! 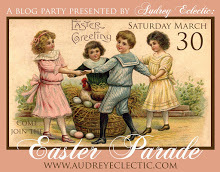 Visit Miss Bunny and all the Tales and Tails girls here. This is the final installment of 4 Faves – Friends Version. But don’t worry, it’s not the end. I’ll do another “Friend Version” in November. Thank you to everyone who shared their favorite things this month. This week’s favorites come from my friends, Amy…she has the first three; and Carrie (Tales and Tails)…she has the last one. 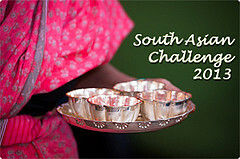 What if you could taste the emotions of whoever prepared your food. 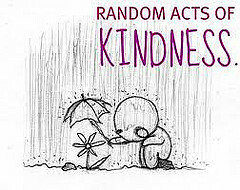 What would you do with the insight this would give you into people’s secret emotions? 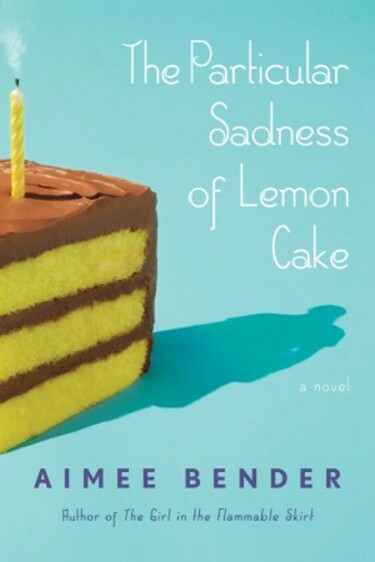 That’s the premise behind The Particular Sadness of Lemon Cake by Aimee Bender, a story that Amy found fascinating. Soaker coats are handy dry or wet. Used dry, a soaker coat is great after a bath or a swim. 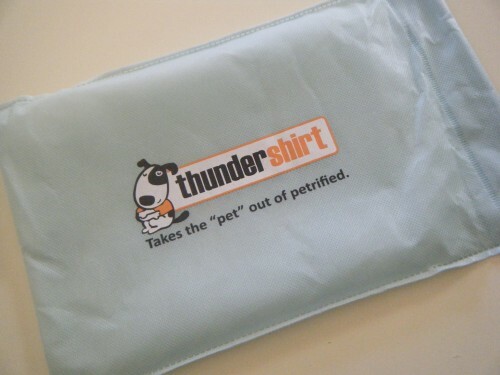 Used wet, a soaker coat can help keep your doggie cool on hot days outdoors. 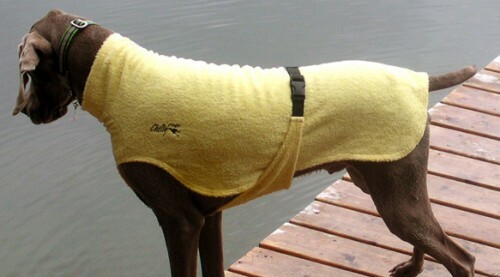 The soaker coat pictured above is from Chilly Dogs. Speaking of Chilly Dogs…Amy loves Chilly Dogs coats. Why? They offer an “Easy On, Easy Off” design; the coats cover your dog’s chest; and the fit is superior because they’re made to the exact measurements of your dog and sport an adjustable buckle system that allows you to securely fasten the coat around your pup’s body. 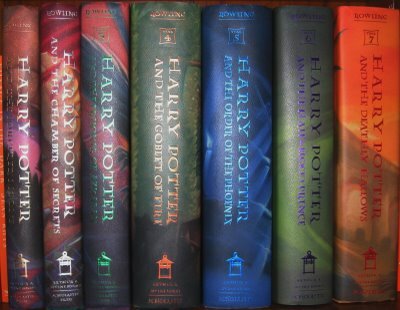 Plus, look how attractive they are. The lovely model…that’s Shadow, one of Amy’s former foster dogs. 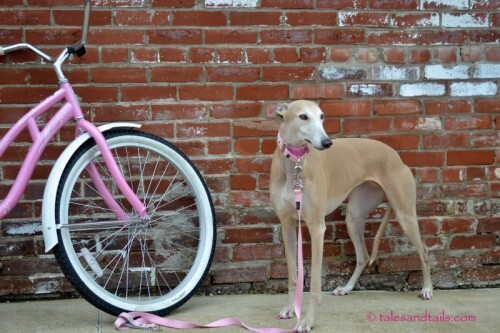 A favorite of Carrie’s…vintage bikes. Want to see more items with the vintage bike motif (or any other motif you can think of), check out Etsy. The stunning model in the picture below…that’s Bunny. 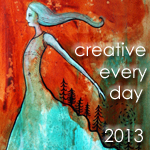 This week’s 4 Faves all come from Carrie, author of Tales and Tails. The beautiful model…that’s Bunny. Carrie loves Thirty-One bags because they come in a WIDE variety of sizes, shapes and colors for a variety of uses. PLUS, you can personalize them! Check out the beautiful colors they come in…not just your basic black.